Despite being of the heretical Shi'a Faith, the armies of the Fatimids were far more traditional to those of the Abbasids, Umayyads and Rashidun Caliphates than any of their contemporary rivals. A majority of the army (Estimated to be 60%) were infantry arrayed by national origin, fighting as a shield wall with spearmen in front with javelinmen and archers supporting from the rear. Either the entire line would advance in the attack, or sections supported by cavalry would./n/nThus it was not the twin monarchs of tribal horse archer and iron-disciplined Ghulam which were the sentinels of the Fatimids on the field of battle. The sword and scepter by which the Shi'ite Caliphate held its dominion was with it's infantry, mostly sword, javelin, and spear wielding Sudanese Slave Warriors, and its cavalry, premier amongst them the Ajnad. Though the Ajnad were the most prestigious of the Fatimid's military, it was their Sudanese infantry which were the backbone from which victory or defeat would be wrought. Of free-men, mercenaries and numerous slave-warriors, theirs was a legacy of deep-seated loyalty and discipline to the Fatimid Caliphate; a bittersweet virtue that came to cause much of their annihilation with the conquests of Saladin./n/nCore amongst their black contingents were the Abid Al-Shira, the professional infantry of whom at least some were slave-warriors. 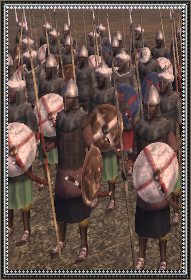 These were the Sparabara, the late-legionaries of Rome and the faithful swordsmen of Muhammad and the early Caliphs, reasonably armored and sturdy-footed spearmen expected to hold the battle line with a shield wall and let their cavalry, archers and javelinmen operate from their foundation. Following the disbanding of the bulk of the Fatimid's administration following their failed coup against Sultan Saladin, the homelands of the wayward sons of the Sudan have become saturated with trained warriors with no scruples of serving a master of any faith just as his beloved Fatimids fielded a bureaucracy of Christians, Jews and Muslims.